Designed for 3 – 6 GPM pressure washers, the Blue Mule Power Wash Combo Foam-All/Spray-All 20 is a machined stainless steel, in-line venturi injection system that quick connects to the trigger gun of a pressure washer. 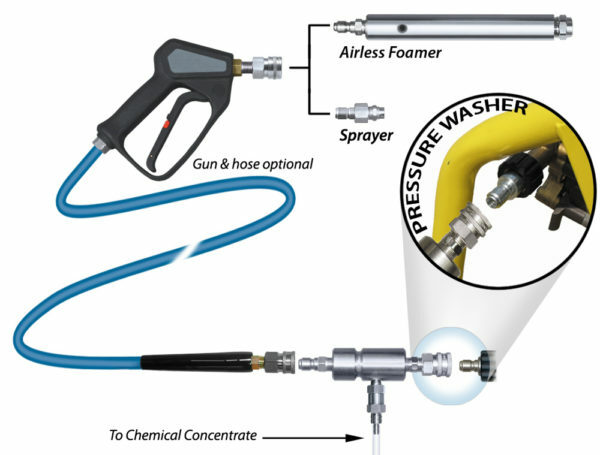 The chemical injector, located at the pressure washer discharge outlet, draws chemical concentrate from any container and dilutes the concentrate to the required ratio. The solution then flows through the hose and trigger gun and is then projected as wet, clinging foam through the fan pattern or zero degree nozzles or as a chemical spray using the fan pattern spray nozzle.